DSC00017, originally uploaded by james.marchington. Well I finally got it finished. Since the summer, in my spare time I've been working on a video about hunting rabbits with an air rifle. When I started I knew it would be a lot of work, but I had no idea just how much! I wanted to show how I stalk a rabbit, using natural cover and the lie of the land. Which is simple enough because you can just set up the camera and do the stalk in front of it. But I also wanted to show the quarry, right up to the moment of taking the shot. And that's not so easy! For some of the shots, I got within range carrying both the air rifle and the camera on a tripod. Then I set up the camera zoomed in on the rabbit, and left it rolling while I set up and took the shot with the airgun - hoping that the rabbit wouldn't hop out of the frame before I fired. For others, I wanted to show the view through the scope as I took the shot - "Guncam" style. That meant I had to rig up the camera on the gun, looking through the scope. That caused enough problems of its own, because the camera has to be fixed very firmly in position, at exactly the right distance behind the scope and in perfect alignment. And then, because there's a camera in the way, you can't look through the scope to take the shot - you have to use the little preview screen on the camera, which is not the easiest thing to aim with. It means you can't hold the gun firmly against you in the normal way, so it's hard to get the gun steady. 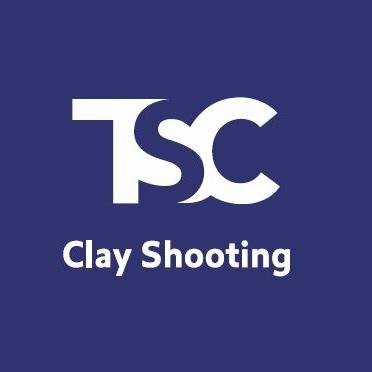 If any readers have experience of filming shots like this, I'd be very interested to hear about your problems, and how you've overcome them. With around 8 hours worth of footage 'in the can', I then had to edit it down to a video of around 1hr 10mins to make it watchable. No-one wants to sit through hours of wobbly shots of bushes while I mutter to myself "where the @$%& has the little $&*£@ gone?!!!" Like a lot of people, I used to snigger at the huge teams of directors, producers, gaffers, grips, lighting cameramen and the rest that are involved on TV shows. Now I understand, and I have huge respect for the people who produce the programmes I enjoy watching. And of course I watch them with a different eye, analysing camera positions, edits, audio and what-have-you. Anyhow, the DVD is now finished, and I've even sold a few (details at www.marchington.com). I've a long way to go before I recover the money I spent on camera and audio gear, tape, blank discs, etc, etc, never mind see anything for my time. If you're ever tempted to make a video in the hope of making a fortune, think again - you'd earn more per hour sweeping the floor in the local supermarket! 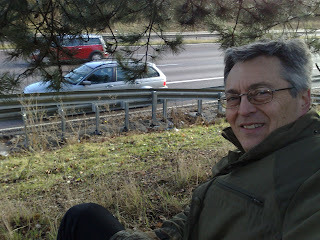 Broken down on the M11! At least I've got a nice warm Seeland coat with me! Update: 2hrs in the bushes beside the motorway, 3hrs tracking down an ATS with the right tyres in stock, eventually reached the office at 4.30pm for my 11am meeting. Still it could have been worse – I might have been going shooting! IMG_8533, originally uploaded by james.marchington. ...is shooting pheasants with a great bunch of people. And lucky me, that's exactly what I was doing! Shot like a muppet on the first drive, but got the hang of it in time for the notorious Oaks drive, and managed three right-and-lefts in a row with the Silver Pigeon 20ga. Very satisfying! IMG_8296, originally uploaded by james.marchington. Thursday afternoon I headed down to Kent to flight woodcock with Mark Gilchrist. I always thought woodcock flying around at dusk were 'roding' and it wasn't really cricket to shoot them, but Mark put me straight. Roding is the mating flight that they do on their breeding grounds in the spring. At this time of year, what they're doing at dusk is flying out of the woods where they've laid up during the day, and heading off for their feeding areas - in this case a wet field where they can probe around for worms etc in the soft soil. Anyway, no luck for me - the woodcock didn't come my way! 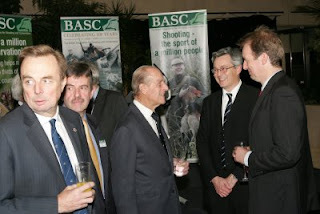 Attended the excellent BASC Centenary reception in London last night, where their patron, HRH the Duke of Edinburgh spoke about the huge amount of conservation work done by shooters. Whilst there I met, among others, Labour MP Martin Salter who it seems is being bombarded by hate mail after shooting his first brace of pheasants. I was in the middle of chatting to Martin when I turned around to see HRH advancing on me, hand extended! It's one of those moments when you hope that some intelligent comment would spring to mind - but caught totally off-guard I fear I just mumbled 'er, er, good evening'. We talked briefly about the wide variety of shooting magazines on the market, before he moved on. Predictably, my teenage daughter was totally underwhelmed by the news that her father had met HRH, which put me firmly back in my place. The BASC photographer snapped the meeting, so I'll see if they can let me have a copy to inflict on readers! (Update: Helen at the BASC press office came up trumps and located the photo now shown at the top of this post). 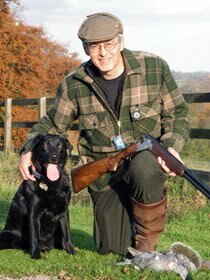 Shooting has welcomed the FAWC opinion on the welfare of reared gamebirds (See here and here). It pretty much echoes the code that the industry has been following of its own accord for ages. The nutters at Animal Aid, however, are trying to claim it as a victory. 'Government welfare body attacks gamebird battery cages' shrills their press release. Indeed it does – it attacks the cages that Britain's game farms don't use, because long ago we looked at what some continental game farmers were doing and didn't like it. So do Animal Aid just not know how gamebirds are reared in Britain, or are they being devious and disingenuous? I'm going for the latter – not least because their press release is littered with more lies, distortions and half-truths. Such as: "gamebirds are not produced for food" (a lie), "the majority of the birds are not even eaten" (a lie), and "nearly forty million [gamebirds] are factory-farmed each year" (a lie). Does anyone take these histrionics seriously? I do hope not. There's a Welsh sheep farmer who always drops in to see us at the Midland Game Fair. I look forward to catching up with him each year, and hearing the latest news in his struggle with the local big cat population - or whatever it is that keeps nabbing his sheep. He's convinced it's a big cat, and having seen some of his photos of mangled sheep it's hard to argue with that. 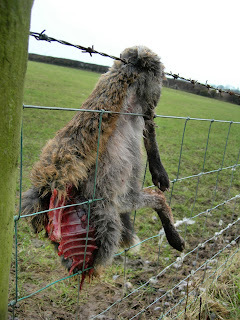 He has just sent me this photo of a fox that was shot one night at 1.30am and hung on the barbed wire fence. When the farmer went to collect it at 9.30am, it had been half eaten by... well, what do you think? Not that sort of rabbit! 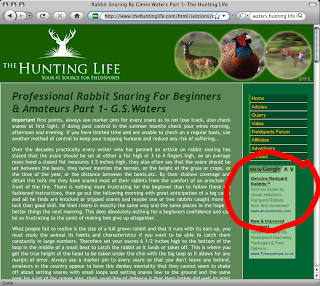 Researching my article on Glenn Waters' design of rabbit snares, I visited The Hunting Life website. In the corner was one of those Google Ads boxes, where the clever software at Google puts in ads that it thinks are relevant. I think this time Google got the wrong end of the stick – Glenn's snares were never designed to catch Rampant Rabbits! 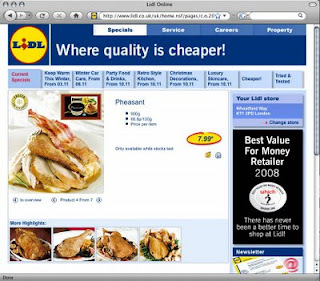 Lidl is the sort of place I associate with frozen burgers and oven chips - so I was amazed to see the supermarket offering pheasant as part of their 'Luxury for All' promotion. Great stuff - it shows how far game has come in the last few years, when what is, let's face it, a fairly downmarket retailer reckons it can make a go of selling pheasant to its customers. At £7.99 a bird Lidl should be making a good mark-up, which I don't begrudge them one bit if it helps to establish pheasant in the urban British diet. 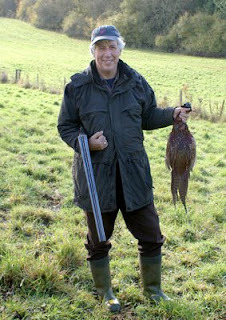 After all, it's hard to be anti-shooting and enjoy a roast pheasant at the weekend.